Romantica, bellissima, super trendy! Deliziosa l'acconciatura! Hey you flower-girl, i love your Head-Jewellery. It´s so Lilli! I alos like your Blouse with the flower-skirt. Pretty nice like as always. Ti ripeto anche qui che ti adoro con questo look romantici e dall'aria bohémien . 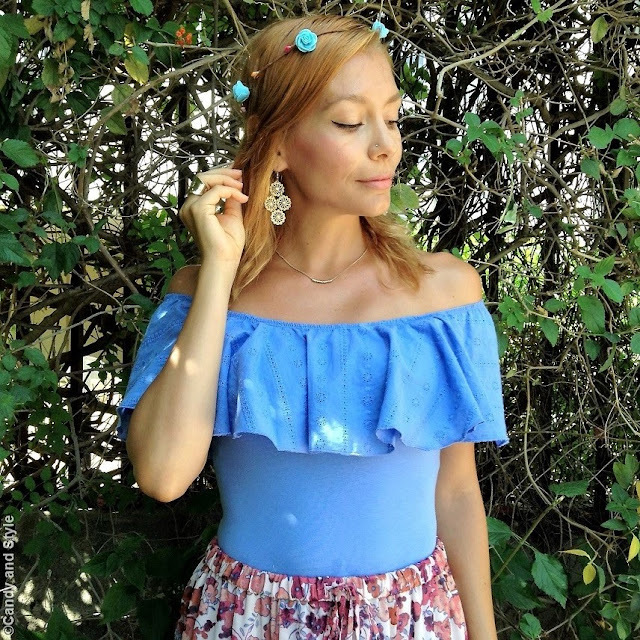 Love the mix of the blue with your floral skirt. Looks so pretty and feminine. I have fallen in love with the blue top, the maxi flowered skirt makes a nice contrast, very feminine and romantic today's proposal. Kisses.